Discover a unique, durable, and cost-effective flooring solution. 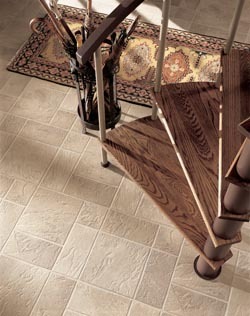 At The Floor Trader of Lafayette, we have your answer with our beautiful vinyl flooring in Lafayette, LA. Designed with busy homeowners in mind, vinyl fits perfectly into any room of your house. Vinyl provides superior moisture protection, while also being durable to foot traffic. This makes it perfect for areas in your home where messes are common, such as kitchens and bathrooms. Vinyl is also soft underfoot, making it a comfortable solution for rec rooms and living spaces. No matter where in your home you want to install your new surface, vinyl is always a solid choice to make. Everyone loves the look of beautiful wood flooring. Well, with vinyl plank flooring you can enjoy the atmosphere that wood provides while also having the durability that vinyl offers. Designed to look and feel like real wood, these planks are the perfect way to add wood-look surfaces to rooms where hardwood isn’t recommended, such as in bathrooms or basements. Thanks to the number of designs and colors available, you can easily match the look of your new vinyl planks, to any existing wood floors. This way you can maintain the same great look throughout your home. Furthermore, if you prefer the majestic look of stone or ceramic tile, then we also have you covered. We offer vinyl tile flooring to mimic the look of tile surfaces while providing a softer more comfortable surface for walking on. No matter what your tastes, our team will help you find the right vinyl surface to fit into your planned décor. In addition to offering vinyl in planks and tiles, we also have it available in large sheets. This lets you quickly convert your home over to vinyl while giving a nearly seamless appearance to the flooring. Additionally, vinyl sheet flooring is highly durable, and when maintained properly will last you up to 20 years. This makes it an excellent investment for any room in your home. While vinyl is simpler to install than other flooring materials, it is still recommended to have our team of professionals handle the installation. Our installers have years of experience handling all types of vinyl surfaces and will ensure that they are laid out properly in your home. By taking care of your vinyl flooring installation, we make sure your new flooring looks as good in your property as it did in our showroom. Contact us when you are looking to install new vinyl floors in your home and need help choosing the right surface. We proudly serve Lafayette, LA, and the surrounding areas. The Floor Trader Showrooms are independently owned and operated. Prices, products and services provided may vary by location.